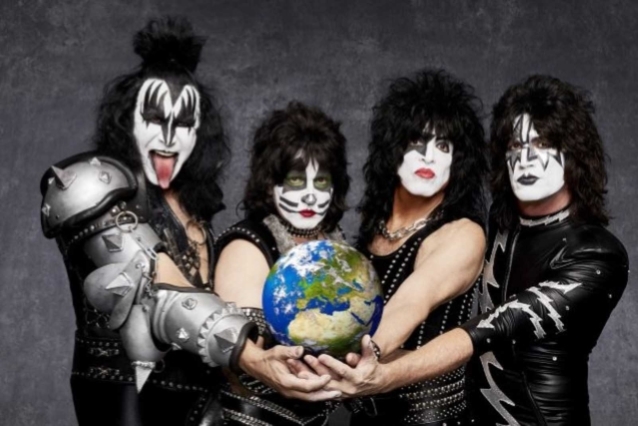 According to Billboard, KISS will perform at the “America’s Got Talent” season 13 finale on Wednesday. The legendary rockers will open the two-hour program, which will air at 8 p.m. ET on NBC. Simmons‘s comments echoed those made by his bandmate, Paul Stanley, who told CNBC‘s “Squawk Box” that KISS will embark on its “biggest tour” next year. Rumors of KISS‘s final run of live shows gained strength several months ago following the news that the band was attempting to trademark the phrase “The End Of The Road.” An application from KISS was filed in February to the United States Patent and Trademark Office, which — should it be accepted — means that the band could use it in connection with “live performances by a musical band.” As it stands now, no official farewell tour has been announced. As most fans remember, back in 2000 and 2001, KISS already performed a “Farewell Tour”. The trek, which was the last to feature drummer Peter Criss, played 142 shows over five legs, covering North America, Japan, and Australia.